So it’s Christmas evening, 2013, and I’ve drunk rather a lot of sangria and eaten a fair amount of roast lamb. I have a plate full of leftovers, I have a VPN, I have Netflix, what can I do but watch “Caretaker”? Awkward fact: “Caretaker” isn’t actually that good. Like, Star Trek pilots tend to be clunky and heavy on the exposition — the best one is still “The Cage”, which wasn’t even allowed to air at the time — but “Caretaker” — well, no, it’s not nearly as bad as “Encounter at Farpoint”, but it’s also a lot less ambitious. “Farpoint” introduced Q, set up the regulars and told us a little more about the history of the Trek universe, with the anarchy of the 21st century that ensued from the Eugenics Wars and World War 3. It’s not what you’d call well-executed, but it was forging new ground, and it took risks. “Emissary” took even greater risks, with the awkward side effect of alienating its audience. (By which I mean my family.) I mean, here was this upstart Sisko holding a grudge against Picard for events that were quite beyond Picard’s control! Why, didn’t he know how much angst (a whole episode!) Picard had had about his assimilation? It’s strange to watch “Caretaker” again as an adult, because I watched it so many times as a teen that I’ve imprinted on certain points. And I couldn’t quite shake that tiny Liz in my head who was trying desperately to impose her own interpretation on it. Like, as an adult, I hate Tom Paris. He uses this tone when he speaks to Janeway in New Zealand, that’s all, “I don’t really respect you, but I have to make a show of it, so I’m going to toe the line.” Sarcastic, that’s what he is. 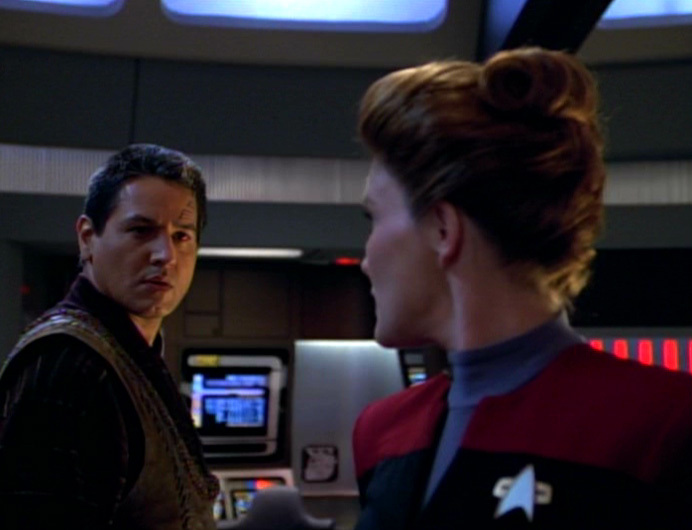 And that’s probably fitting for Paris in that moment, but in a contemporary setting, it would seem like he was disrespecting Janeway because she’s a woman. NOT A GREAT SCENE FOR INTRODUCING THE FIRST REGULAR FEMALE CAPTAIN, is what I’m saying. And then Paris just grates more and more and more. Like, his next scene, he’s right up in Lieutenant Stadi’s personal space. Dude, she’s flying the shuttle. Let her do her job. Basically, by the time he was rescuing Chakotay — a scene with TWO “Isn’t there some Indian custom” lines — I was seriously wishing I was watching some other character. The exception, of course, is Deep Space 9 — Bashir totally wants to be the suave ladies man, but he’s not, and thankfully he gives up very quickly. Otherwise, the closest DS9 comes is Garak, and he doesn’t exactly have an eye for the ladies, if you know what I mean. Well done, DS9, we’re all very impressed with you, but you’re not the Trek I’m talking about today. 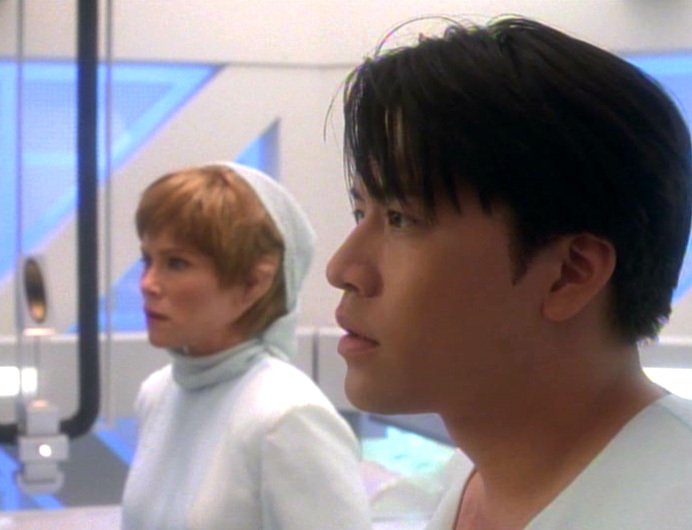 No, I’m here with Voyager, wondering why the closest thing we have to a POV character is … hey, look, the only flesh and blood white guy in the cast. There’s nearly 600 words about how Tom Paris is awful. And I haven’t even mentioned how all the Starfleet officers who don’t think he’s great wind up dead! Instead, let’s talk about something great. Like Harry Kim’s floppy hair. Look at that floppy fringe! Seriously, 13 year old Liz, why weren’t we all over that? We LOVED floppy haired boys! Harry, as a POV character, is a much better option than Paris. He’s fresh out of the Academy! He’s super smart, and brave (sooooo dreamy! ), but has a bit of snark when he’s pushed. Note to self: build time machine, go back, rewrite Voyager script. Harry is also great when he’s interacting with B’Elanna, and I would totally ship them if I didn’t know it was pointless. Roxanne Dawson had been acting since the ’80s, but this was Garrett Wang’s first job, so it’s impressive that he’s so assured. 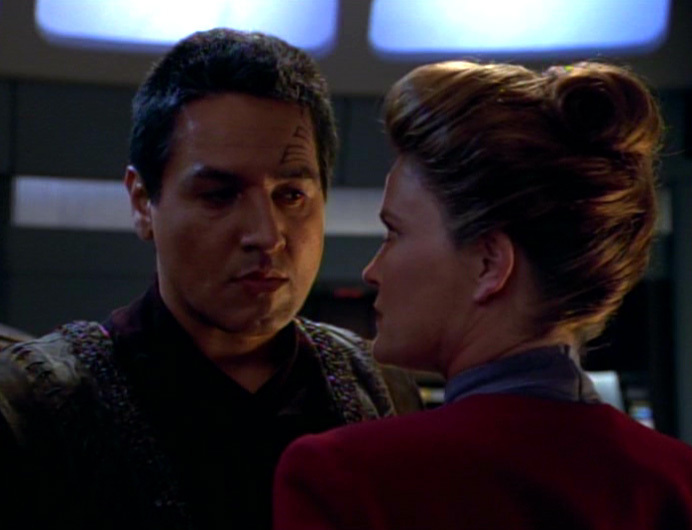 SPEAKING OF, when I was younger, I kiiiiiind of maybe didn’t pay much attention to characters who weren’t Janeway or Chakotay. So it’s nice to come back, and be unexpectedly blown away by how amazing Roxanne Dawson and Jennifer Lien are as B’Elanna and Kes. Especially since they both get some really terrible, clunky lines, because it’s a well-known fact that writers of Star Trek have all knowledge of actual human dialogue wiped from their minds. They also have some excellent footwear. Hey, the ’90s are back! I’m all about grey ankle boots! Now, I have loved Neelix since day one, but it wasn’t until now that I realise why: he is basically Fozzie Bear. In all of his scenes with Tuvok, you could close your eyes and think you’re listening to Fozzie. It’s GLORIOUS. And I am totally into Tuvok and Neelix as the Kermit and Fozzie of Voyager. Remember when these three were going to be the ensemble leads? Yeah. I bet Robert Beltran and Tim Russ remember, too. Aw man, that five minutes they let Kate Mulgrew’s own hair out to play! And then they decided there “wasn’t enough of it”, so out came the wig. Wigs. Things I didn’t notice in VHS: Janeway’s bun actually changes style and even colour at various points through the episode. 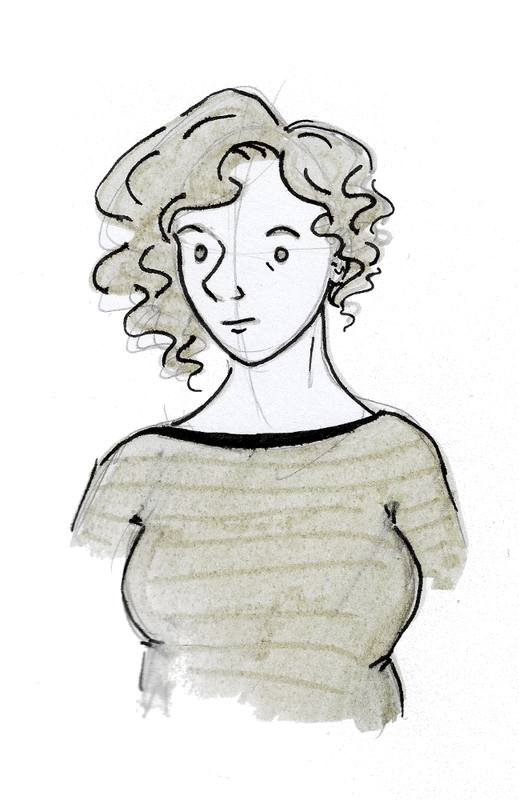 Sometimes, The Hair is reddish, and in a curly sort of bun, and sometimes it’s brown and in a plainer bun. Kate Mulgrew said that all the fussing around her hair was really to mask discomfort with having a woman in charge. And you can kind of tell there were some, uhhhh, issues around that. She’s powerful but nurturing! Commanding but tender! She talks to people’s families! She likes dogs! We can have a female lead, it all says, but we have to really make sure she’s safe. Yeahhhhhhh. It kind of works, because it’s not like Starfleet gives out captaincies to complete lunatics, but for me, Janeway becomes more interesting when that normality starts cracking. 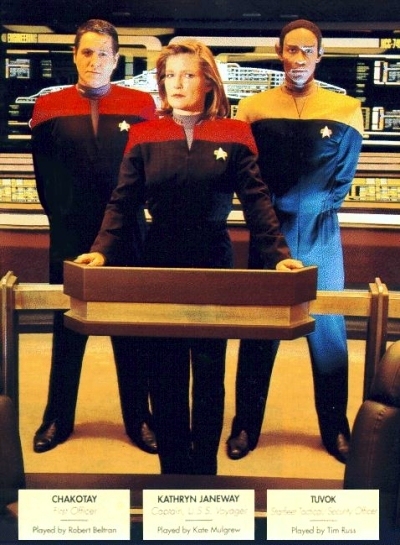 My number one regret for Voyager is that the Starfleet/Maquis division vanished so quickly. 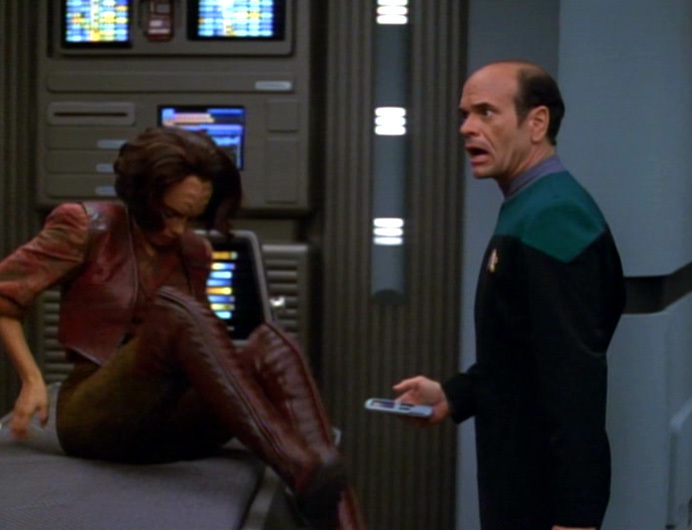 And not just because I really dig B’Elanna’s civilian boots. This is a bad cap, but they’re like, red leather thigh-highs with detail in the front and stitching down the back? Freedom fighter chic! On the other hand, “have a cool idea, fail to execute it to its full potential” is basically the whole story of Voyager’s writing. Except for Seven of Nine’s arc, because … well, lots of reasons, many of which don’t reflect well on the producers and writers involved. BUT WHY AREN’T YOU KISSING YET? Next Next post: Birds, though!